When it comes to utilising future digital technology, automotive industry is always ahead of others. New innovations will reshape driving experience. Augmented Reality(AR) is the one in which real world real time environmental elements are modified by the computer. AR system generates a composite view for the user that is the combination of the real scene viewed by the user and a virtual scene generated by the computer that augments the scene with additional information. How is automotive industry utilizing it? The industry is trying enhance automotive purchase process and redefining driving experience with the help of new technology. Wearable gadgets delivering augmented reality user experience are being used for this purpose.Some car companies also use digital showrooms to present different car variants to consumer. How is this technology enhancing automotive purchase process? Wearable technologies like Oculus Rift enables a consumer to test drive a vehicle without even stepping foot inside it.Earlier this year, Audi revealed that it is going to have virtual reality (VR) car showroom. Tata Tiago was promoted in the market with help of free basic VR set. This gives potential customers an idea for the look and feel of their potential new purchase through a virtual test drive. This is the closest experience one can give their audience. How is this technology redefining driving experience? Automakers are building prototype for Google Glass that leverages the ability of eyeglass style wearables to deliver information directly into the wearer’s field of vision. Last year in Shanghai Auto Show,BMW Mini launched Mini Augmented Vision,the first ever digital eyewear with see through technology offering connectivity to vehicle. This concept seamlessly interconnects applications inside and outside the vehicle while providing the driver with greater vision, increased safety and comfort. User will get vehicle speed information, navigation direction, parking assistance, real time driving updates etc through the the gadget. 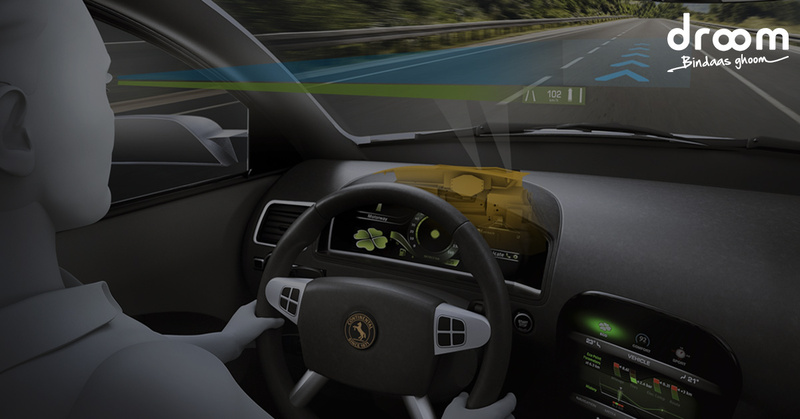 Also, AR based Head-up Displays (HUDs) are transforming automobile windscreen into larger computer screens displaying travel information like navigation indication, vehicle speed, weather information, live traffic data etc. What are the disadvantages of this technology? AR based windscreen can provide too much information which can distract the driver.This technology is dependent on internet. Car gets online connectivity through smartphone. In case the signal is low ,data connectivity will be weak and AR will no longer work. What is the Future of AR ? AR in automotive industry is at a nascent stage. It has immense potential to enhance drivers safety and make the driving experience more comfortable. Companies like GM, Audi are installing 4G LTE technology in their vehicles so that car connects to internet independently. Droom’s Orange Book Value: India’s Only Pricing Tool! Practical data.. car navigation system with rear view camera Fortunate enough me personally I came across your website inadvertently, that i’m surprised the reason that twist of fate couldn’t came about in advance! My partner and i saved the idea.